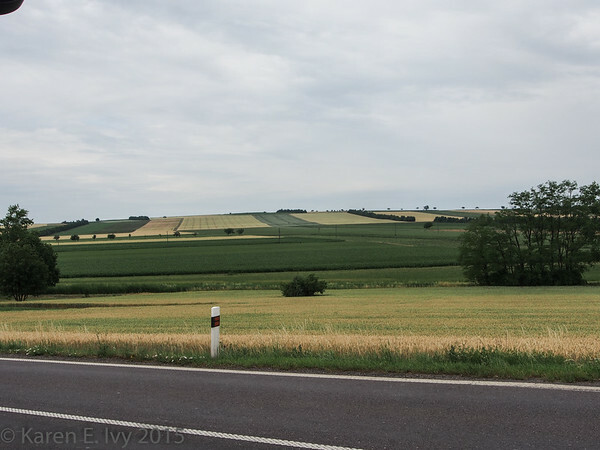 Czechia (the new name for the Czech Republic) had more woodsy areas interspersed with the farms. But I kept wondering about the road, until someone reminded me that, until the Soviet Union fell, Czechoslovakia (as it was then) was behind the old Iron Curtain, so you can drive from Vienna to Bratislava on a highway (Slovakia was not Soviet), but to Prague, you take back roads because nobody’s built the highway. 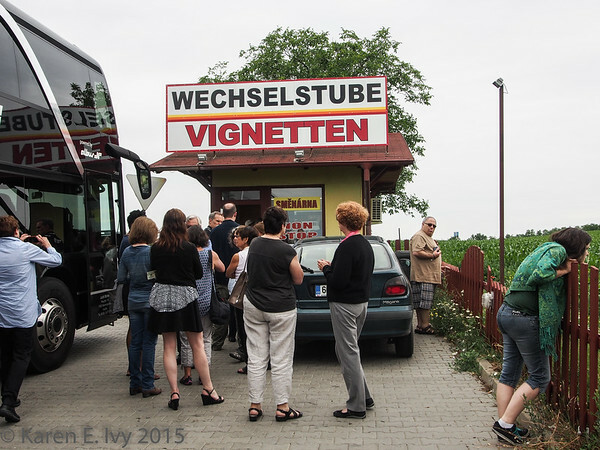 We made a modest stop at the Czech border – the Czech police pulled the bus over and asked to see everybody’s passport, or so the guide told us. (I did see the police interviewing another driver behind us, a little while later; they must have been looking for someone.) We all dived for wherever we’d put the passports, and the guide got off the bus, then shortly came back and said, no passports needed, she had convinced the police that we were just a group of traveling Americans. 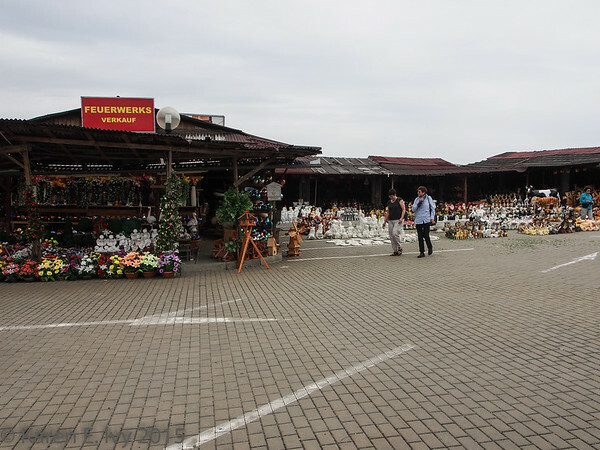 Then she said, oh, in case you need Czech money (korunas), there’s a currency exchange place here. You can see the line of customers, all from the bus; some travelers apparently don’t get their foreign currency before they leave home. Yes, that says “American Chance Casino.” In English. As close to the border as it can get. Clearly a tourist trap. As a resident of California who regularly travels to Nevada, this tells me that Austria doesn’t allow casinos! 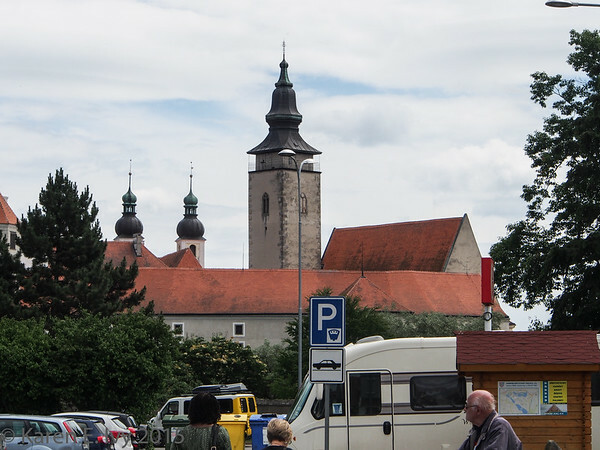 For that matter, the Asia Shopping Center, also in the middle of nowhere (right across the road from the Casino), suggests that sales taxes may be lower in Czechia than in Austria, and the ad for Feuerwerks suggests that Austria may not allow sale of fireworks. I still think the casino would have had an in-house currency exchange operation. It did have a play area for the gamers’ children, complete with at least one bouncy house and a large plaster dinosaur. This was also the point at which a couple of travelers suddenly realized that their passports hadn’t made it onto the bus. At this point I have to give our Executive Director, Steven Payne, his combat medal. 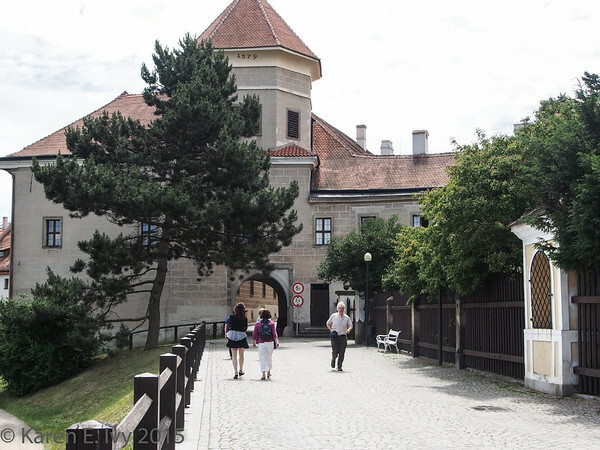 He phoned for a taxi (which took forever to come), and drove off to the nearest train station where he could ride into Vienna. He returned hours later with the passports and a woman’s performance dress which somehow hadn’t got packed! 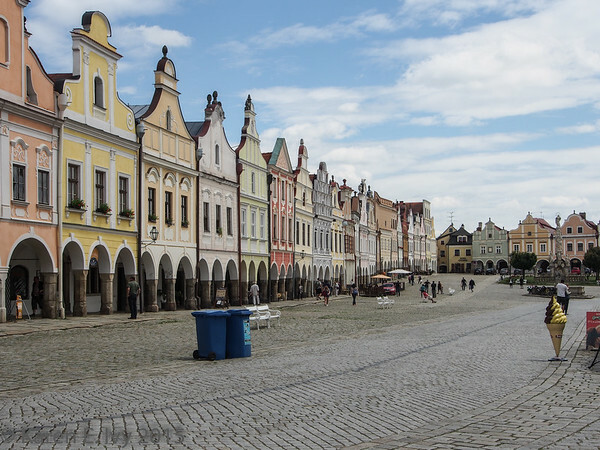 Eventually we moved along, having our in-transit rehearsal on the top deck of the bus, and stopped at the charming little town of Telč (pronounced “telch”) for lunch. 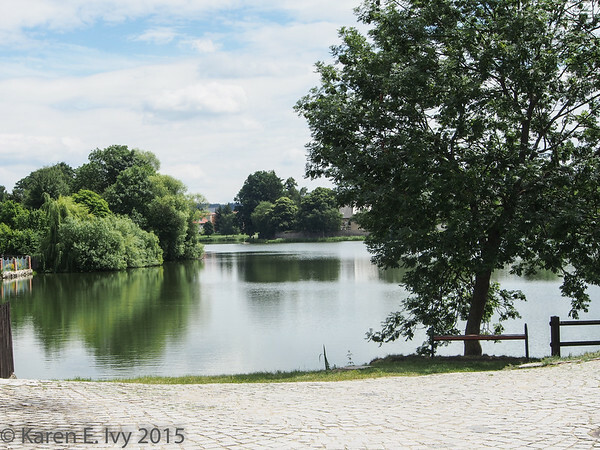 We parked the bus outside the town and walked in past some older buildings and a lake, with ducks (invisible in this shot but there are more photos in the gallery, click on the photo of the lake). Jim and I had a lovely lunch, all by ourselves – we stopped at the first restaurant we saw, on the edge of town, and found ourselves the only tourists in the place. 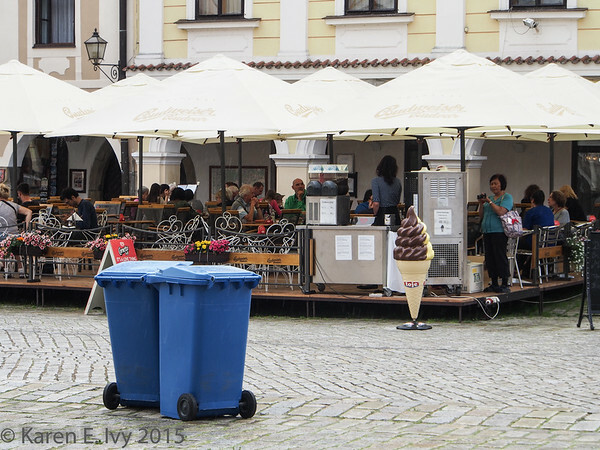 Everybody else trailed all the way into the town square and fought for tables at the restaurants there. Feeding 70-odd people all at once is not trivial. 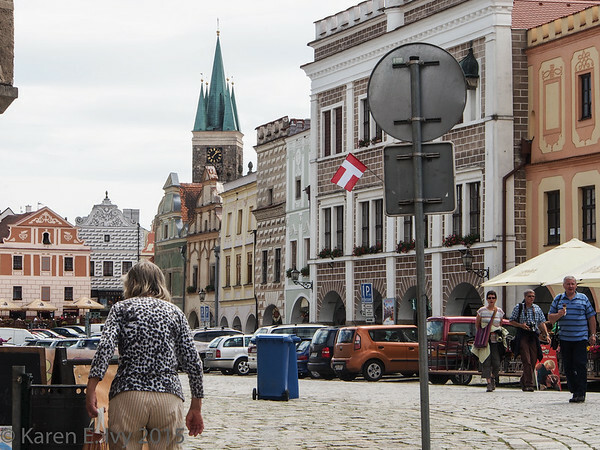 Telč was a walled town; here’s the old city gate, followed by the town square. 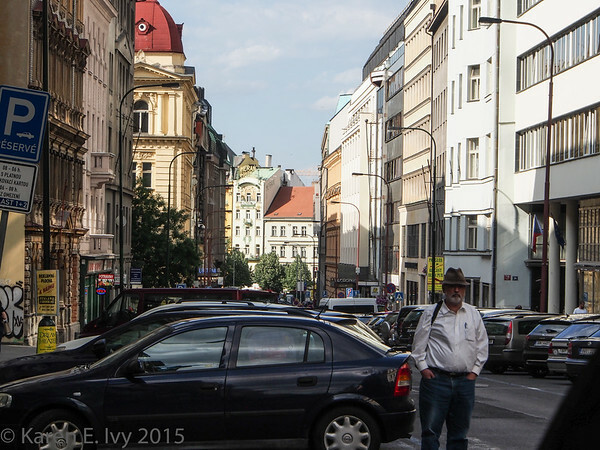 One of the local guides we dealt with in Prague told me that, back under the Communists, all the buildings were grey, and almost immediately after the Communist regime fell, people started painting the colors back. I can’t swear to this, but it’s a great story, let it stand. 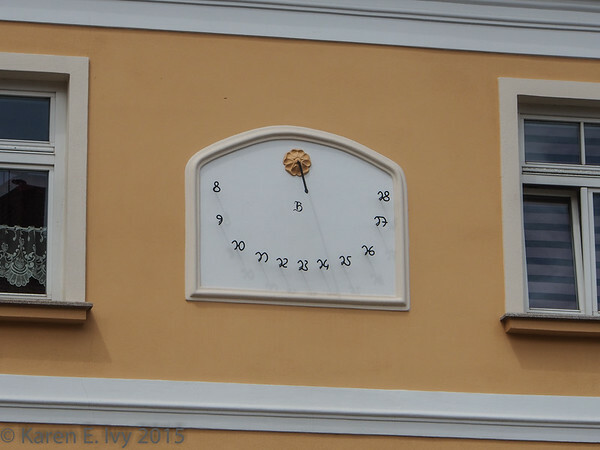 On the way out of Telč, we passed the oddest wall clock I’ve ever seen, which I must share. If any of my traveled friends knows why the Czechs would have a clock like this, I’m dying to hear it! All I can say is, you try it. The angry driver finally gave up and backed down the block. I was totally gobsmacked to find that the Hotel Majestic was – a Best Western! I didn’t realize they had a “premium” line. 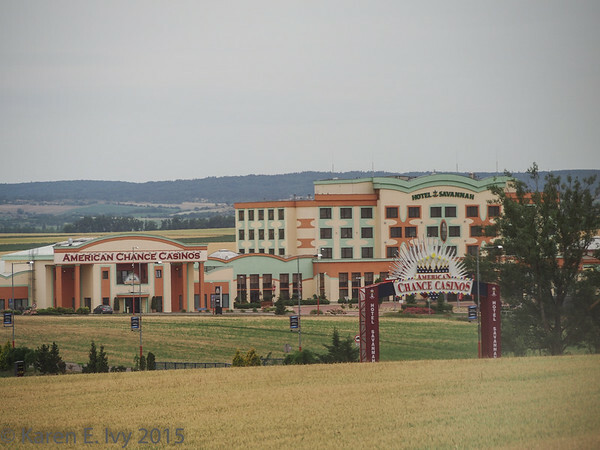 It was a very nice hotel, though, on this trip second only to the Lindner in Vienna.